Description: Walter Brueggemann declares that the necessary character of truly prophetic preaching today is "a contestation between narratives." If the dominant narrative of our time promotes national self-sufficiency (through militarism) and personal self-sufficiency (through consumerism), it must be opposed by a different narrative. Prophetic preaching takes its stand in a world claimed by a God who is gracious, uncompromising�and real. Brueggemann writes here for leaders in faith communities who bear the responsibility of preaching. He describes the discipline of a prophetic imagination, in an unflinchingly realistic, unwaveringly candid manner. Citation: Leonard Mare, review of Walter Brueggemann, The Practice of Prophetic Imagination: Preaching an Emancipating Word, Review of Biblical Literature [http://www.bookreviews.org] (2014). 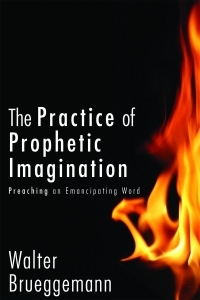 Citation: Ron Clark, review of Walter Brueggemann, The Practice of Prophetic Imagination: Preaching an Emancipating Word, Review of Biblical Literature [http://www.bookreviews.org] (2014).